You are presented with a shelf of 100 books. Scroll along the bookshelf and select the book you want to read. Alternatively, you can use the sort and search functions, or answer a few questions to have books recommended for you. Hold the DS like a book, and turn pages by swiping across the touch screen. 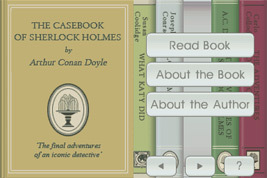 By tapping the top you can view a menu which allows you to select a bookmark or set background music or ambient sounds. Upon completing a book, you are asked to rate the book out of 10 and to choose a word that best describes it. This "review" is uploaded when you access the Nintendo Wi-Fi Connection.